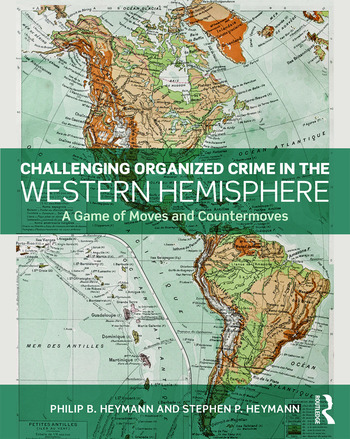 Challenging Organized Crime in the Western Hemisphere: A Game of Moves and Countermoves takes the unusual approach of exploring and describing how organized crime groups develop their capacities in response to heightened powers of law enforcement; and how law enforcement in turn responds, creating an ongoing dynamic interaction. The book shows how a state, such as the United States, has and can develop new laws and practices in ways that enable them to deal with relatively large violent groups—and yet preserve the rule of law and civil liberties. While most texts describe organized crime groups and the challenges to government they impose from a static perspective, the authors dissect the interaction over time of organized crime and democratic governance that has created the present structure and balance of advantages in the United States. Readers learn about the markets for contraband and extortionate protection that form the bulk of organized criminal enterprise, the vulnerabilities of the traditional practices and rules of law enforcement, the effects of globalization of criminal enterprises on their contest with the state, the effectiveness of various practices of law enforcement, and the continuing forces of change, often technological, in the businesses of organized crime and law enforcement that play important roles in the contest between them. This thought- provoking book is ideal for students of organized and transnational crime in university programs and law schools, as well as researchers and legal practitioners, who seek to look beyond the simple traditional history of organized crime and develop a strategy to confront organized crime in the future. 4. A Final Issue of State Strategy: Rules of War or Law Enforcement. Philip Benjamin Heymann is the James Barr Ames Professor of Law Emeritus at the Harvard Law School. After graduation from Harvard Law School he clerked for U.S. Supreme Court Justice John Marshall Harlan. At the U.S. Department of Justice he was then Assistant to the Solicitor General (1961-1965), Assistant U.S. Attorney General in charge of the Criminal Division (1978-81) and Deputy Attorney General (1993-94). At the U.S. Department of State (1965-1969), he was Acting Administrator of the Bureau of Security and Consular Affairs, Deputy Assistant Secretary of State for the Bureau of International Organizations and Executive Assistant to the Undersecretary of State. Among the number of articles and books he has written while teaching at Harvard Law School, Heymann is the author of four books on combating terrorism: Terrorism and America (MIT Press 2000); Terrorism, Freedom, and Security (MIT Press 2003); Protecting Liberty in an Age of Terror with co-author Juliette Kayyem (MIT Press 2005); Laws, Outlaws, and Terrorists (with co-author Gabriella Blum (MIT Press 2010). He is also the author of the Politics of Public Management (Yale University 1987) and Living the Policy Process (Oxford University Press 2008). Stephen Philip Heymann’s career as a federal prosecutor spanned over 33 years. During that time, he received commendations for his work from the Director of the FBI, the General Counsel for the Navy, the Director of the Secret Service and the Director of the Executive Office of U.S. Attorneys. He is the recipient of the Attorney General’s Distinguished Service Award. During his career, Stephen Heymann was a member of the Justice Department’s elite Organized Crime Strike Force; established and directed one of the country’s first, dedicated cybercrime units and was Deputy Chief of the Criminal Division of the U.S. Attorney’s Office in Boston, where he advised on all aspects of investigation and case structuring. Among his significant cases, he led what the FBI then described as one of the most significant Asian Organized Crime cases in its war against non-traditional organized crime; conducted the first court-authorized wiretap of a computer network, resulting in identification and charging of a foreign national breaking into U.S. military systems from Argentina; and successfully investigated a transnational group engaged in stealing tens of millions of credit and debit cards from TJX and other major US retailers. The last was described by the Attorney General of the United States as the largest and most complex identity theft case then brought in the country.